By Ben Sichel. Ben is a teacher in Dartmouth and author of the P-12 education section for the Canadian Centre for Policy Alternatives’ Alternative Provincial Budget. Originally published at no need to raise your hand. It’s Treaty Day in Nova Scotia, a day marking the Peace and Friendship treaties signed in the 1700’s between the Mi’kmaq people and the occupying British crown. 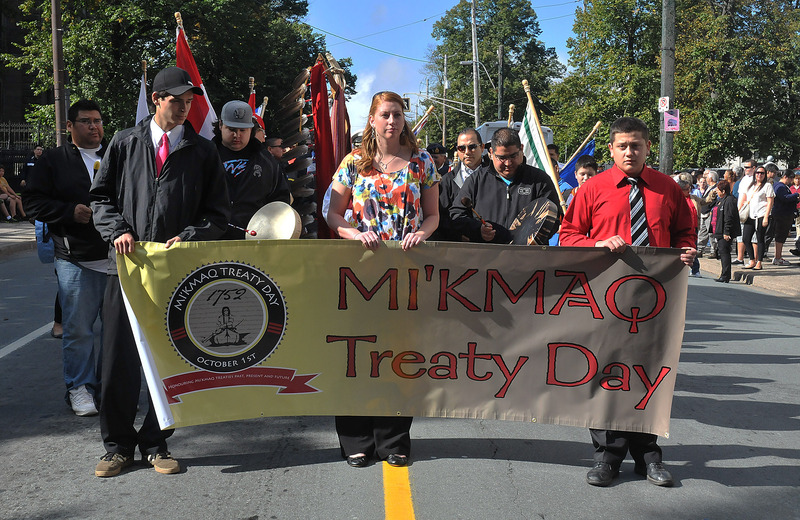 Treaty Day parades and celebrations are led by the Mi’kmaq community, but it’s important for non-Natives in this province to mark the occasion as well. The most succinct way I’ve heard this expressed is in the phrase “we are all treaty people.” This is because a treaty is, by definition, an agreement between two parties. The treaties signed between sovereign Indigenous nations and the British in the 1700’s are just as relevant to the descendants of the British, and by extension anyone who lives in Nova Scotia today, as they are to the Mi’kmaq. There’s a common perception in Canada today that treaties and treaty rights, such as the hunting and fishing rights many people are familiar with, are something that only concerns Indigenous people. But the British benefited from the treaties too: they gained the right to live unhindered on the land the Mi’kmaq had lived on for centuries. The British, and all other non-native folks who’ve lived on this land since the British took it over, have enjoyed that treaty right ever since. The Mi’kmaq were supposed to be able to enjoy that right in perpetuity as well. Things haven’t quite worked out that way. A protest against the dumping of brine waste in the Shubenacadie and Stewiacke rivers is perhaps the latest evidence. Happy Treaty Day to everyone, and if you’re non-Native, let’s commit this year to getting our side to keep our part of the bargain.